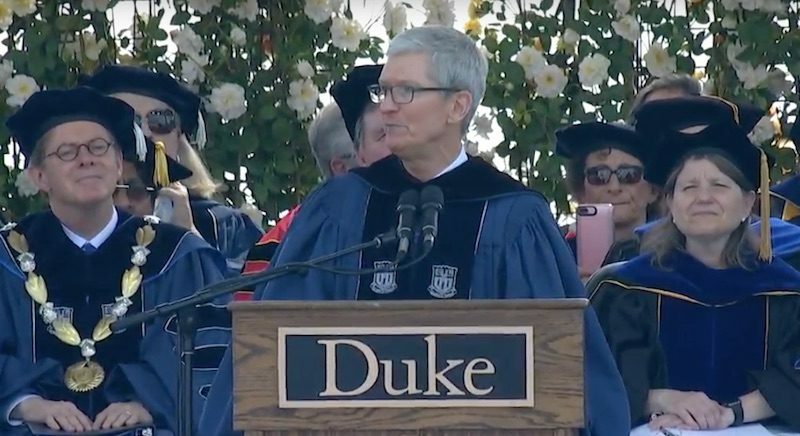 Apple CEO Tim Cook today delivered the 2018 commencement address at his alma mater Duke University in Durham, North Carolina. He also reflected on Apple's commitment to the environment, privacy, immigration, and gun control, supporting the Me Too movement against sexual harassment and students involved in the Stoneman Douglas High School shooting. Cook's commencement address was similar to those he has delivered at a number of other universities in recent years, including at his undergraduate alma mater Auburn University in 2010, at George Washington University in 2015, and at the Massachusetts Institute of Technology last year. Cook is a 1988 graduate of Duke's Fuqua School of Business and a member of the university's Board of Trustees. If thinking different means maximising profit margin by shutting down side-business like Airport routers, Mac Mini and bringing gimmicky Touch Bar to the Pro line while stripping it of the industry standard USB ports, SD card slot and the life-saving MagSafe adapter... then DON'T THINK DIFFERENT !!! Is this guy *ever* at the Apple campus? Judging from his tweets it’d seems he is everywhere else but. The kind of lavatorial quality control of products and services Apple is suffering under him is shameful and disgusting. He only seems to be interested in nothing more than cash in his fat pockets and biased, liberal, lopsided agenda-driven politics. Just leave Apple and run for a Dem post already FFS, at least give Apple a bloody chance to get back to great products again! Tim Cook is a visionary. What a speech. Challenge the status-quo. Be the last to accept the world cannot be improved. Build a better way forward. Tim Cook is not a visionary. Tim Cook is a conventional bean counting CEO who inherited a very popular and trendy brand from a true visionary. The brand is still popular enough they can paste the logo on most anything and it’ll sell like hot cakes, but poorly conceived and incomplete products like HomePod might not be saved by the brand name. I actually wish Apple would encounter a financial set-back in the future so the board will realize it’s time to put a real visionary back in charge of this corporation. Apple isn’t doomed, but the wash-rinse-repeat formula won’t work forever. LOL... what a hypocrite. Tim Cook is just plain cynical. He turned one of the most creative companies into a corporate scam. Greedy, abusive. That man is sick. Queue the typical Tim Cook bashing. He's doing great with Apple. Ugh. Tim needs to stop dragging sacks of Steve around like it's who he is. Anyone can clearly see it isn't. Tim isn't a visionary, Tim is a businessman. And that's fine? Nothing wrong with a profitable company - but Steve dropped enough acid to be able to look at the intersection between humans and tech differently. That was a unique perspective. That perspective pushed the iMac and the iPod and smaller one-hand-usable iPhones - and their relationship to human beings made them game changers. But nowadays? That thinking is gone. FaceID.. come on. Steve's biggest rant was you start with the consumer and solve problems. Face ID, massive iPhones, TouchBar - all the opposite. Even small things like moving the power button. It was placed on the top of the phone to feel like a padlock locking. On the side - it doesn't have that same human interaction effect. If Apple released a human centred designed phone - an iPhone SE 2 with a one-hand usable screen, same form factor, kickass battery and cameras, shrink the massive iOS 11 menus in Music etc, give iOS some more depth (some "real" skeuomorphism), Touch ID under the screen, price aggressively and go for volume - that thing would ****ing explode. Tim should challenge apple to "Think Different" and design "more repairable" macs and iOS devices, keyboards that can be easily replaced, memory and hard-drives that can be upgraded and not be proprietary and restrictive.